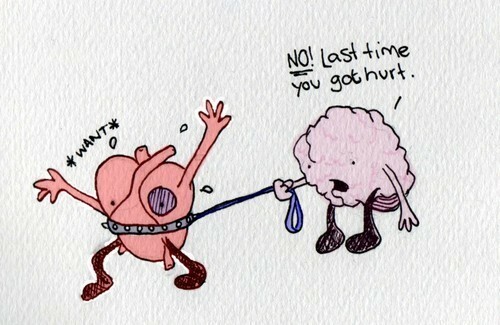 Head or Heart, that is the question. Emotions can be felt by everyone around the world; one doesn’t have to be clever to experience them. However, although there’s a general explanation of sadness, for example, everyone experiences it differently. Hence, feelings are unique. They also have an important role in influencing behaviour and understanding. In many situations, feelings gain the upper hand and steer one in another direction than one’s head (= reasoning) would do. For example, if a fourteen-year-old girl conceived, she might first think that the baby would ruin her life, destroy all her career opportunities and that she had too few experiences to raise it. But then, maybe ‘feeling’ this tiny little something in her body might affect her emotions and change her mind, without any particular reason. This immense feeling of love (to an unborn) might eventually rule out any doubts or thoughts arguing against the pregnancy. Her thoughts might actually change ‘to the good’ and add positive things to make her feel better about her decision, for example, that a child could make her a much more responsible person and that she could still finish school and have a career with the help of others. In the end, the decision would be right for her and she would not be able to tell whether she made the wrong or right decision, because she would never know how (better or worse) it would have worked out differently. Does this demonstrate that emotions somewhat control our thoughts? Or maybe, that they even should, to some extend? I generally follow the voices in my head – i.e. logic and reason. My mother and my sister on the other hand tend to go with their feelings (their ‘heart‘ that governed by emotions and dreams or their ‘gut‘ that is fueled by instinct and intuition). When my sister fell in love with a boy who studied far away, she changed all her plans and followed him. As they broke up, she moved away and, again, reorganised her life. Is it just love, that has such a strong power? I might say that I’d never do this or that, but how do I know what my sister felt? Maybe, if I loved someone really badly, I would do the same? My conclusion is that feelings (be they emotional or instinctual) do have a great impact on thoughts and reasoning. They make us real human beings that can actually sense. Some people might refer to themselves as always following their heads, but I believe that – unconsciously – their hearts and guts do affect their ‘heads’ to some extent. Nevertheless, there are probably people who learned to ignore their feelings more than others and might end up with a psychological illness or simply unhappy. ‘Cos if you always follow your head and ignore your heart, you’re ignoring yourself. This entry was posted on 21/02/2011 by G in Academia, Psychological Issues, Some Philosophical Rambling and tagged emotions, gut feeling, head, heart, reasoning.